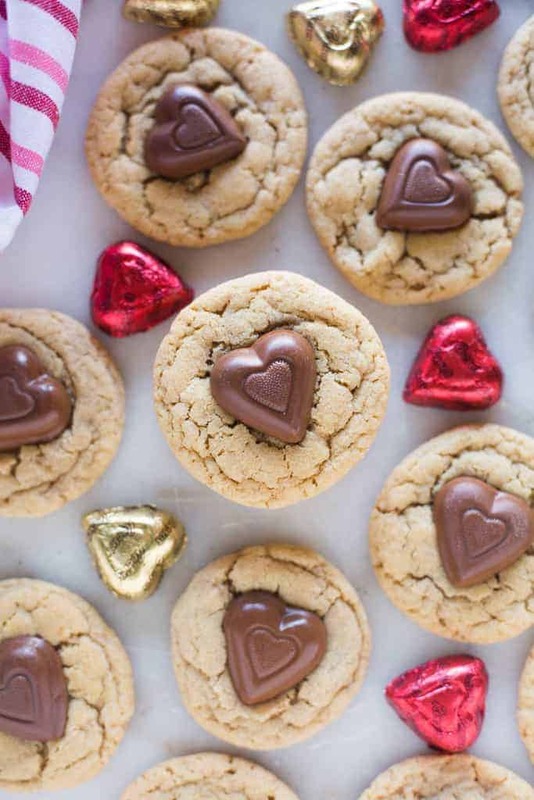 You’re sure to win over your sweetheart with these amazing Peanut Butter Heart Cookies. 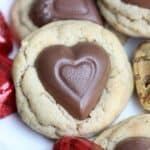 My favorite soft and chewy peanut butter cookies, with a Reese’s peanut butter heart pressed into the center. Since we’re getting close to the holiday where we celebrate our sweethearts, I’ll tell you a little something sweet about MY sweetheart. I’m a total sucker for Reese’s holiday peanut butter cups. Do you know the ones I’m talking about? They’re shaped as pumpkins at halloween, Christmas trees at Christmastime, and hearts during Valentines? They are WAY better than the regular Reese’s! They’re packed with twice as much peanut butter filling, and the chocolate isn’t “waxy” like it sometimes is with the mini Reese’s cups. My ideal cookie has a slight crisp to the outside, but is really soft and chewy. These Peanut Butter Cookies are exactly that. They are fantastic! Start with mixing together the butter, shortening, brown sugar and white sugar. I like the butter/shortening combination in these cookies because you get the best of both worlds: that delicious buttery flavor with the tenderness that the shortening adds. The brown sugar and white sugar combination also adds to the rich flavor and chewiness in these cookies. Next, add the eggs and vanilla. Then mix in the dry ingredients, just until everything is combined. The dough will be pretty soft. 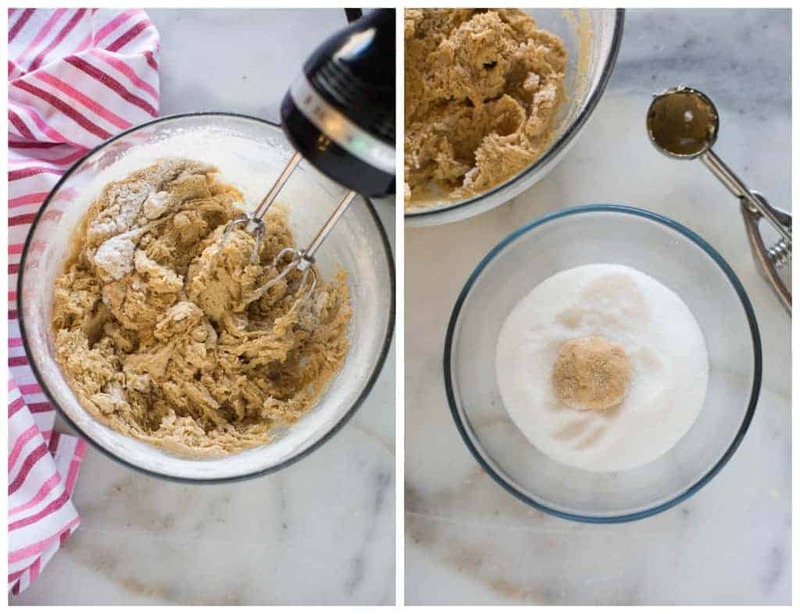 Use a cookie scoop or spoon to scoop the dough. This recipe will make about 2 dozen cookies. Roll each dough ball lightly in granulated sugar and place them on a parchment lined baking sheet. Bake them for 7-10 minutes. You don’t want them to get brown around the edges at all. We want to avoid hard, crumble-y cookies at all costs, so be careful not to over bake them. They will look just set, and pale. Remember, they will set up more as them cool. Remove them from the oven and allow them to cool on the baking sheet for 3 minutes. Remove them to a wire cooling wrack, press a Reese’s hearts into the center of each cookie and then allow them to cool completely. I love how much cuteness the Reese’s hearts add! They take these already amazing peanut butter cookies and send them over the top! FOLLOW ME on FACEBOOK, TWITTER, INSTAGRAM and PINTEREST for more great recipes! 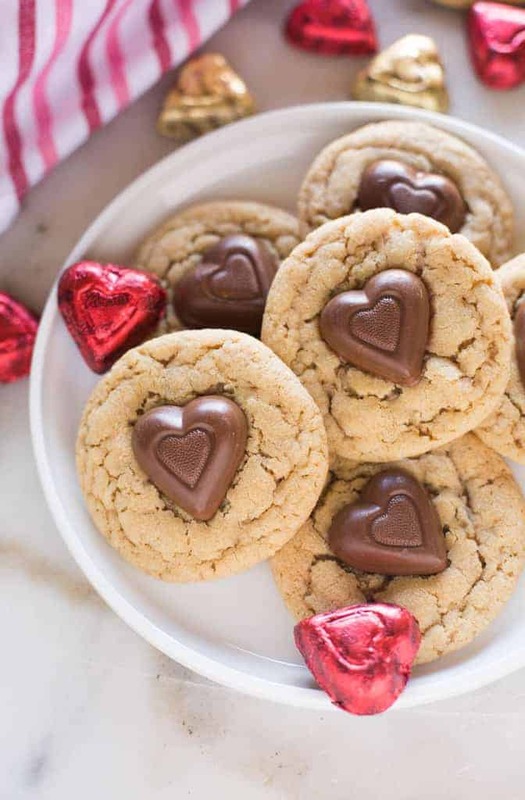 My favorite soft and chewy peanut butter cookies, with a Reese's peanut butter heart pressed into the center. 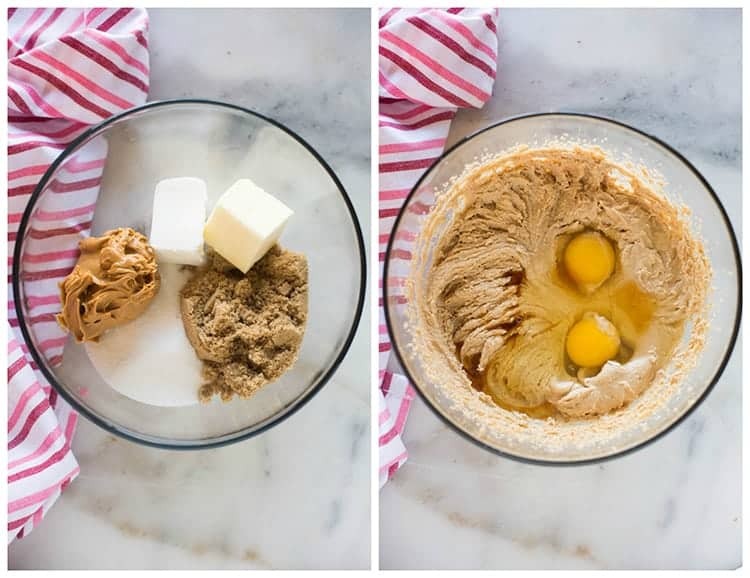 In a mixing bowl cream together butter, shortening, peanut butter, 1/2 cup granulated sugar, and brown sugar until light and fluffy, about 2 minutes. Add and eggs, mixing after each addition. Mix in the vanilla. In a separate bowl whisk together flour, baking soda, and salt. Stir dry ingredients into the wet ingredients and mix gently to combine. Don't over-mix. The dough will be very soft. Pour remaining 1/2 cup of granulated sugar into a small bowl. Line a cookie sheet with parchment paper. Scoop dough into balls and then roll in sugar. Bake for 7-10 minutes, just until set. They will be pale, and look just barely set. Don't over-bake them or they will be hard once cooled. Remove from oven and allow to cool on baking sheet for 2-3 minutes, and then transfer to cooling rack. 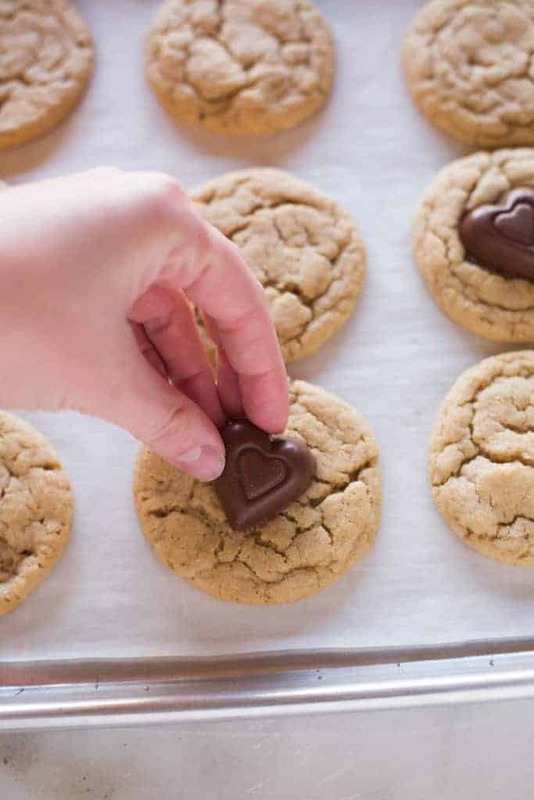 Press an unwrapped Reese's heart to the center of each warm cookie. 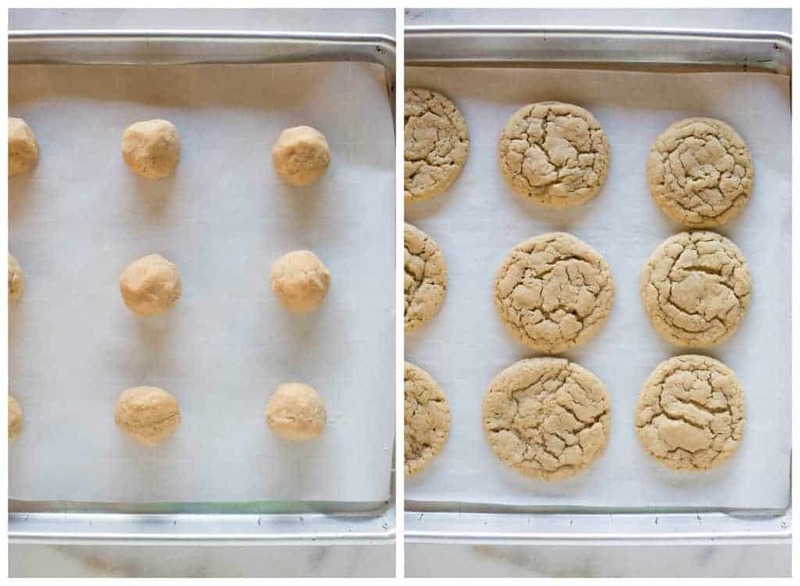 Allow cookies to cool completely. 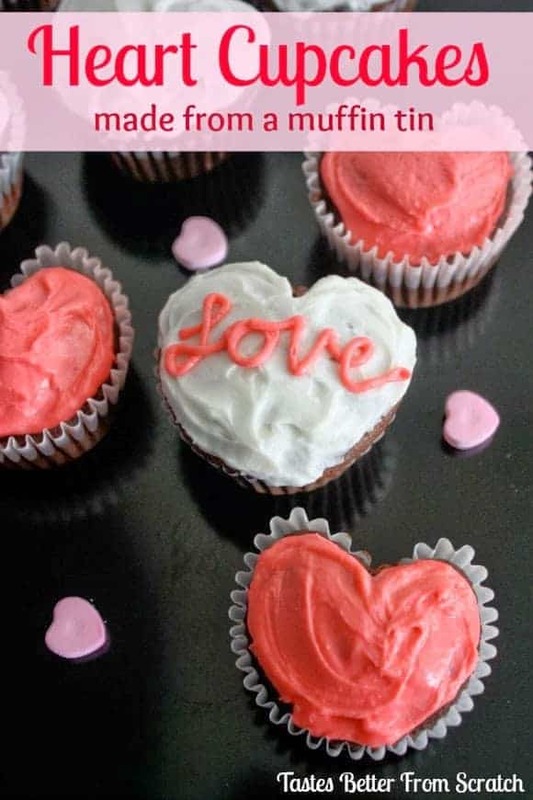 Looking for more fun Valentine treat ideas? Oooh these look so good and I’m with you on soft cookies…crackers are supposed to be crunchy not cookies. I’ve never seen those Reese’e hearts but I am going to pick up a bag next time I’m at the store. Thanks for the great recipe! I saw these and could not wait to make them. That happened today and they did not disappoint! I doubled the recipe and used coconut oil and they were so good. My sons were outside playing in the snow and came into the house to the smells. One son who is not really a sweet eater at three! He told me the peanut butter in the hearts was so good. Thank you for sharing such a great recipe. I put most of them in the freezer to save to share with out Sunday School class next month. I love these cookies!! They were perfect, thanks Lauren! Just one note- don’t put your hearts on until the cookies are on the cooling rack or else they will melt!! Would it work if I use all butter and no crisco ? I don’t like to use crisco. The cookies look great for Valentine’s Day! Can’t wait to make this this weekend. Thanks! Hi Donna, All butter would be fine–the texture will just be a little different. I would also suggest whipping the butter first, before adding the sugar and pb. 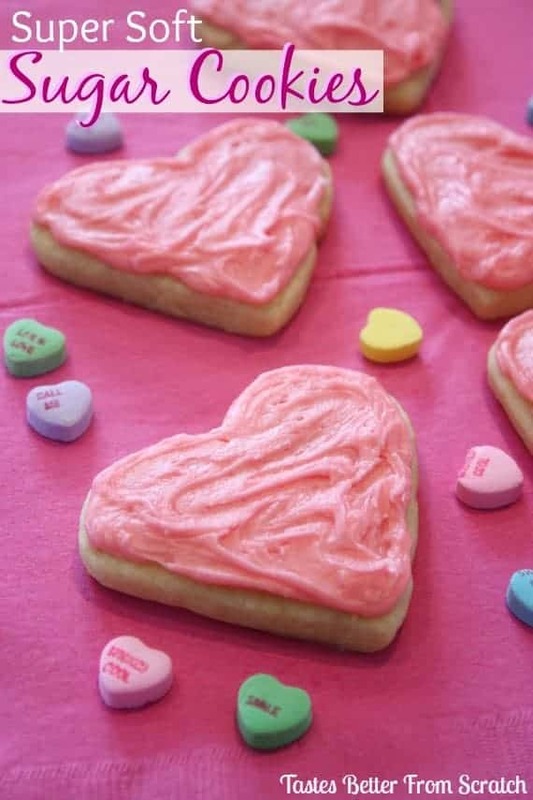 I made these cookies last night for Valentines Day and they were delicious! It was a little tricky trying to keep the chocolate from melting, but most of them turned out fine! I’ve made these before using a different recipe, and using solid chocolate hearts, and they weren’t near as tasty as your recipe! Thanks so much Kelly! So happy you liked them. Hope you had a great Valentines! I was super excited to make these because pb kiss cookies are my favorite Xmas cookie. I thought they turned out really cute! Mine stayed soft(maybe almost to soft) but I wished they had more peanut butter flavor. If I make them again I will add more peanut butter.